Free Friday! 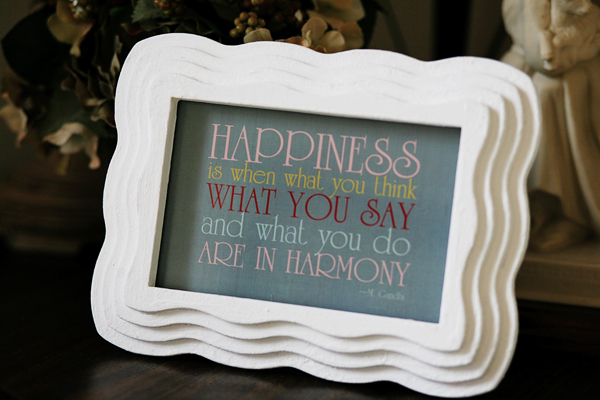 "Happiness Is" Quote – It Works For Bobbi! Published on April 29, 2011 March 23, 2017 by Bobbi-Jo G.
This week’s free printable is a 4X6 of another favorite quote…this time by Ghandhi. I think it’s a very true statement, and a wonderful reminder of what happiness really is. I have this displayed in my livingroom where I can see it regularly. It helps me remember not only what happiness IS, but what it ISN’T. We all need that, don’t we? Click below to download. Hope you enjoy! I'm having trouble downloading this one. I was able to get some of your other printables, but this one is not working. When I click on it, it says, “the item you are trying to access has either been deleted or is unavailable you to”… Am I doing something wrong? i love the frame you used for this one! Thanks to SugarDoodle I found you! I LOVE your printables, thank you!!!! Thnk you very much Bobbi-Jo. I love this quote. I also love your frame. Where did you get the FRAME?? Love! OMG I LOVE your blog!! I really love this printable too!! Thanks for sharing!! I read your blog which I assume has been written after deep thought. I have been following you for a while and have asked my friends also to do so.